ROFIN-SINAR Technologies Inc. (NASDAQ: RSTI) ("ROFIN" or "the Company"), one of the world's leading developers and manufacturers of high-performance laser beam sources, laser-based system solutions and components, today issued the following letter to shareholders to provide an update on the status of discussions with SilverArrow Capital Advisors, LLP ("SilverArrow"), which had previously announced its intention to nominate three individuals for election to the Board at ROFIN’s 2016 Annual Meeting of Stockholders. As you know, SilverArrow Capital Advisors LLP issued a press release in October 2015 announcing its intention to nominate three individuals for election to the ROFIN Board of Directors at the 2016 ROFIN Annual Meeting of Stockholders. ROFIN has engaged in extensive communications with SilverArrow over the last several months in an attempt to avoid a contested proxy campaign and allow ROFIN to focus on executing its business plan, which the Board is confident will create sustainable long-term value for all shareholders. The Nominating Committee of the ROFIN Board, consistent with its standard practice and its fiduciary duty to ROFIN shareholders, conducted a thorough evaluation of the proposed director nominees put forward by SilverArrow Capital. The process included a review of historical experiences, an assessment of skill sets, a review of written responses to questions posed, in-person and telephonic discussions, and extensive background and reference checks on each of the proposed candidates. After a careful analysis of the entirety of this information, ROFIN presented the basis for a reasonable settlement to SilverArrow with the goal of reaching a resolution and avoiding a costly proxy contest. The ROFIN offer included the appointment of one of SilverArrow’s three proposed candidates, Mr. Gebhard F. Rainer, to the Company’s Board of Directors, subject to the negotiation of a customary settlement agreement. After considering the experience, backgrounds, character and qualifications of the other two nominees put forward by SilverArrow, the Committee concluded that both would be unsuitable for appointment to the Board for numerous reasons. These reasons included, in the case of one proposed nominee, a lack of any meaningful business experience, and with respect to the other proposed nominee, a questionable track record of focusing on short-term results at the expense of sustainable value creation and an unwillingness to provide requested professional references from his prior employers. ROFIN’s offer included a proposal to have further conversations with SilverArrow, to provide it with a more complete understanding of the Committee’s decision and reasons as to why the other two proposed candidates were deemed unsuitable. Unfortunately, SilverArrow has responded to ROFIN’s good faith offer with a series of demands, legal threats and a "take-it-or-leave-it" offer that demonstrates that it has no interest in reaching a mutually acceptable settlement. Among other demands, SilverArrow has insisted that any settlement must include all three of its proposed nominees, regardless of whether they have the necessary skill set and character to serve as effective directors. Furthermore, SilverArrow’s "offer" insists on the retirement of all three of ROFIN’s highly qualified directors standing for re-election at the upcoming Annual Meeting. SilverArrow specifically stated that the Company’s acceptance of these demands was needed before SilverArrow would engage in any further settlement discussions. We are disappointed that SilverArrow has rejected our constructive settlement offer and, in effect, refused to continue dialogue. The Company believes adding one of SilverArrow's proposed candidates, Mr. Rainer, to the Board is a reasonable and acceptable way to add an individual that both SilverArrow and ROFIN deem suitable. We continue to prefer to avoid a disruptive and costly proxy contest and to instead stay focused on executing on our business plan, but we simply cannot engage in settlement discussions under the onerous terms and one-sided process that SilverArrow demands. The Company has not withdrawn its settlement offer as presented to SilverArrow and remains open to reasonable settlement discussions. We believe our current Board composition provides the right combination of experience, backgrounds and qualifications to effectively fulfill the responsibilities to our shareholders. The Board is active and engaged, and combines deep industry knowledge with a diversity of professional experiences growing companies for the benefit of shareholders. The ROFIN Board includes eight highly qualified Directors, a majority of whom are independent Directors, separate CEO and Chairman roles and a Lead Independent Director. Our Nominating Committee, Audit Committee and Compensation Committee consist entirely of outside independent directors. Independent of SilverArrow’s actions, we have added new skills and perspectives to the Board of Directors with the recent appointment of Jenifer Bunis, a 30-year veteran of the industrial laser sector. As demonstrated by our offer to add Mr. Rainer to the Board, the Board remains open to adding additional directors with the knowledge, experience, character and skills that can enhance its ability to deliver long-term value to all shareholders. ROFIN does not believe that SilverArrow’s interests are aligned with the long-term interests of the Company and its shareholders. We are disappointed in SilverArrow’s unreasonable approach to settlement discussions and its most recent response, which requires the replacement of three highly valued members of the Board with SilverArrow’s three nominees (two of whom, as noted above, the Committee has determined do not have the requisite skills and characteristics appropriate for Board membership). SilverArrow has made numerous misleading and outright inaccurate statements in its press releases and other materials, despite ROFIN’s repeated clarifications to SilverArrow about the actual facts. These statements appear to be designed to damage the Company, mislead shareholders and advance SilverArrow’s own self-serving agenda. While we would have preferred to keep our discussions with SilverArrow private, we believe shareholders deserve to know the truth, and will be providing further information, as appropriate, at a later time. • SilverArrow has incorrectly stated that ROFIN entered a related-party transaction with ROFIN Director Mr. Carl Baasel at above market rates. As noted in the most recently filed 10-K and as described to SilverArrow, the property leased from Mr. Baasel was part of the assets transferred in 2000 in connection with the Company’s acquisition of ROFIN-BAASEL Lasertech of which Mr. Baasel was a minority shareholder. At several points during the lease term, additional space was leased by the Company from unaffiliated third parties, at rates that were generally comparable to those being paid under the Baasel lease. As further noted in the 10-K, the Company is consolidating operations into a single facility and gave the required two-year notice of lease termination to Mr. Baasel in December 2014. • SilverArrow has stated that ROFIN director Mr. Daniel Smoke was the subject of allegations related to his tenure as CFO of JAC Products Inc. In short, Mr. Smoke, along with the various other individuals and entities associated with the sale of the company, were sued by the purchaser, and counterclaims were brought. Mr. Smoke denied all of the allegations asserted against him. The court dismissed the case in its entirety with no adverse findings and without costs to any party. SilverArrow has made numerous references to the shareholders it "represents," but we believe that SilverArrow is acting only in its own best short-term interests at the expense of long-term shareholder value. ROFIN welcomes input and constructive engagement with all shareholders, including those that constitute the SilverArrow investor group with whom we have not had the opportunity to engage in the context of the settlement discussions, and looks forward to continuing our dialog with all of you. We can assure you that your Board and management remain focused on creating long-term value for all the Company’s shareholders. We have demonstrated a sustained strategic effort to deliver value to shareholders through improved performance, strategic acquisitions, efficiency improvements, technological innovations and personnel changes, as well as through returning capital to shareholders. We have made significant investments to position the Company for long-term growth and profitability, and we have already begun to reap the benefits from these investments. With an expanded product portfolio and more efficient, lower-cost manufacturing capabilities, ROFIN is positioned to build on this momentum and drive long-term sustainable value. Thank you for your continued support for ROFIN as we work together to create meaningful shareholder value in 2016 and beyond. The Company, its directors and certain of its executive officers may be deemed to be participants in the solicitation of proxies from the Company’s stockholders in connection with the matters to be considered at the Company’s 2016 annual meeting of stockholders. The Company intends to file a proxy statement with the U.S. Securities and Exchange Commission (the "SEC") in connection with any such solicitation of proxies from the Company’s stockholders. INVESTORS AND STOCKHOLDERS ARE STRONGLY ENCOURAGED TO READ ANY SUCH PROXY STATEMENT AND ACCOMPANYING PROXY CARD AND OTHER DOCUMENTS FILED WITH THE SEC CAREFULLY AND IN THEIR ENTIRETY WHEN THEY BECOME AVAILABLE AS THEY WILL CONTAIN IMPORTANT INFORMATION. Detailed information regarding the identity of potential participants, and their direct or indirect interests, by security holdings or otherwise, will be set forth in the proxy statement and other materials to be filed with the SEC in connection with the Company’s 2016 annual meeting of stockholders. Information regarding the direct and indirect beneficial ownership of the Company’s directors and executive officers in the Company’s securities is included in their SEC filings on Forms 3, 4 and 5, and additional information can also be found in the Company’s Annual Report on Form 10-K for the year ended September 30, 2015, filed with the SEC on November 30, 2015, and our other filings with the SEC. Stockholders will be able to obtain any proxy statement, any amendments or supplements to the proxy statement and other documents filed by the Company with the SEC for no charge at the SEC’s website at www.sec.gov. Copies will also be available at no charge at the Investor Relations section of our corporate website at www.rofin.com. "Safe Harbor" Statement Under the Private Securities Litigation Reform Act. This press release contains "forward-looking statements" within the meaning of the safe harbor provisions of the U.S. Private Securities Litigation Reform Act of 1995. Forward-looking statements can be identified by words such as: "target," "future," "continue," "anticipate," "believe," "estimate," "expect," "strategy," "likely," "may," "should" and similar references to future periods. Examples of forward-looking statements include, among others, statements we make regarding future plans, events or performance, including guidance relating to revenues and earnings per share; expected operating results, such as revenue growth and earnings; expected seasonal impact; current or future volatility in the exchange rates and future economic conditions; anticipated levels of capital expenditures, including for corporate actions such as share buybacks; expectations of our long-term financial prospects, margin and cash flow expansion; and our strategy for growth, product portfolio development, market position, financial results and reserves. Forward-looking statements are neither historical facts nor assurances of future performance. Instead, they are based only on our current beliefs, expectations and assumptions regarding the future of our business, future plans and strategies, projections, anticipated events and trends, the economy and other future conditions. Because forward-looking statements relate to the future, they are subject to inherent uncertainties, risks and changes in circumstances that are difficult to predict and many of which are outside of our control. Our actual results and financial condition may differ materially from those indicated in the forward-looking statements. Therefore, you should not rely on any of these forward-looking statements. Important factors that could cause our actual results and financial condition to differ materially from those indicated in the forward-looking statements include, among others, the following: downturns in the machine tool, automotive, semiconductor, electronics, photovoltaic, and medical device industries which may have, in the future, a material adverse effect on our sales and profitability; the ability of our OEM customers to incorporate our laser products into their systems; the impact of exchange rate fluctuations, which may be significant because a substantial portion of our operations is located in non-US countries; the level of competition and our ability of to compete in the markets for our products; our ability to develop new and enhanced products to meet market demand or to adequately utilize our existing technology; third party infringement of our proprietary technology or third party claims against us for the infringement or misappropriation of proprietary rights; the scope of patent protection that we are able to obtain or maintain; competing technologies that are similar to or that serve the same uses as our technology; our ability to efficiently manage the risks associated with our international operations; risks associated with recent changes in our senior management personnel; any adverse impact to us resulting from the announcement or implementation of any one or more of our cost reduction programs; the worldwide economic environment, including specifically but not limited to in Asia; the distraction to management and costs resulting from an actual or threatened proxy contest; any changes in our board as a result of a proxy contest; and such other factors as discussed throughout Part I, Item 1A. Risk Factors and Part II, Item 7. Management's Discussion and Analysis of Financial Condition and Results of Operations of our Annual Report on Form 10-K for the year ended September 30, 2015. Any forward-looking statement made by us in this press release is based only on information currently available to us and speaks only as of the date on which it is made. We undertake no obligation to publicly update any forward-looking statement, whether written or oral, that may be made from time to time, whether as a result of new information, future developments or otherwise. With 40 years of experience, ROFIN-SINAR Technologies is a leading developer, designer and manufacturer of lasers and laser-based system solutions for industrial material processing applications. The Company focuses on developing key innovative technologies and advanced production methods for a wide variety of industrial applications based on a broad scope of technologies. The product portfolio ranges from single laser-beam sources to highly complex systems, covering all of the key laser technologies such as solid-state, fiber, ultrashort pulse and CO2 lasers, as well as diode lasers, and the entire power spectrum, from single-digit watts up to multi-kilowatts, as well as a comprehensive spectrum of wavelengths or pulse durations and an extensive range of laser components. 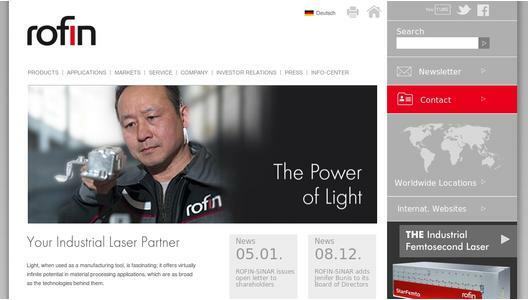 ROFIN-SINAR Technologies has its operational headquarters in Plymouth, Michigan, and Hamburg, Germany, and maintains production facilities in the US, Germany, UK, Sweden, Finland, Switzerland, Singapore and China. 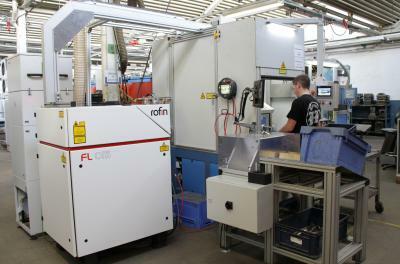 ROFIN currently has more than 55,000 laser units installed worldwide and serves more than 4,000 customers. The Company's shares trade on the NASDAQ Global Select Market under the symbol RSTI and are listed in Germany in the "Prime Standard" segment of the Frankfurt Stock Exchange under ISIN US7750431022. ROFIN is part of the Standard & Poor's SmallCap 600 Index and the Russell 2000 Index. 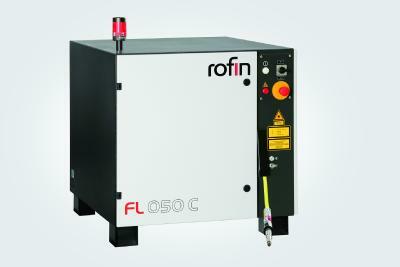 Additional information is available on the Company's home page: www.rofin.com.